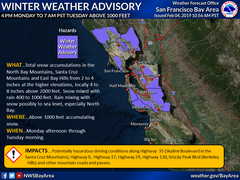 The National Weather Service has issued a Winter Weather Advisory for the Bay Area with the chance of seeing snow as low as 1200 feet. This means we could all wake up to a dusting on Mt Diablo tomorrow. Of more concern though is the overnight low, which could get down near freezing. With all of the rain we have had this could create some areas of black ice in the morning. Drivers, cyclists, and pedestrians are encouraged to take a little extra time and apply some extra caution when going out and about in the morning hours.